A particular challenge in developing reliable process models for steels and other advanced alloys (e.g. Al, Mg) is that the effect of alloying elements on the moving interfaces (grain boundaries or inter-phase interfaces) during microstructure evolution (grain growth, recrystallization, phase transformation) is poorly understood from a fundamental perspective. An innovative methodology in this regard is to model across different length scales. Process models are formulated on a macroscopic length scale while underlying physical parameters result from phenomena on the atomistic scale. Thus, modelling tools will be combined that cover different length scales, i.e. starting from ab-initio atomistic modelling of the interaction of alloying elements with the moving interface the modelling length scale will be gradually increased via the scale of the microstructure (i.e. so-called meso-scale) by employing the phase field approach and finally to the macro-scale of the industrial product. Process models with predictive capabilities for hot rolling, annealing and welding are gaining increasing attention with the goal to develop and optimize processing routes for novel advanced high strength steels (e.g. dual-phase steels). It is crucial for process modelling to develop models which accurately describe the microstructure evolution during industrial processing. Current activities emphasize studies on phase transformations in steel on the run-out table of a hot mill, on a hot-dip galvanizing and in the heat affected zone of welds, respectively. In addition, the physical metallurgy work includes the investigation of precipitation, recrystallization and grain growth kinetics. 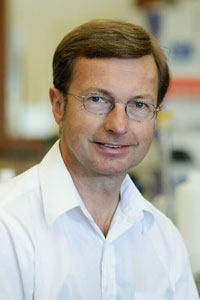 Primary Collaborators: Warren Poole (UBC), ArcelorMittal Dofasco, Evraz. Interdisciplinary research has been initiated on novel Cu interconnects for advanced microelectronics. With decreasing feature sizes deep into the submicron region, the RC delay of metallization lines and dielectric layers becomes rate limiting rather than the gate delay of transistors. Thus, Cu replaces Al as the material of choice for interconnects in modern chip architecture because Cu has a lower resistivity. Electrodeposition is the method of choice to form Cu films. Interestingly, electrodeposited Cu films show self-annealing at room temperature. The microstructure evolution during self-annealing is associated with recrystallization. The initiated project emphasizes the investigation of the recrystallization and grain growth mechanisms in electrodeposited Cu films. The long term objective is to extend the concept of microstructure engineering to thin films and microelectronics. Primary Collaborators: Dan Bizzotto (UBC). “Phase-field modeling of cyclic phase transformations in low-carbon steels “, B. Zhu, H. Chen and M . Militzer, Journal of Computational Materials Science, in press. “Overview of the current issues in austenite to ferrite transformation and the role of migrating interfaces therein for low alloyed steels”, M. Goune, F. Oanoix, J. Agren, Y. Brechet, C.R. Hutchinson M. Militzer, G. Purdy, S. van der Zwaag and H. Zurob, Materials Science and Engineering R 92, 1-38 (2015). “Phase-field modeling for intercritical annealing of a dual-phase steel”, B. Z hu and M. Militzer, Metallurgical and Materials Transactions 46A, 1073-1084 (2015). “The effect of solute Nb on the austenite-to-ferrite transformation”, T. Jia and M. Militzer, Metallurgical and Materials Transactions 46A, 614-621 (2015). “Superledge model for interphase precipitation during the austenite-to-ferrite transformation”, M.Y. Chen, M. Goune, M. Militzer, Y. Brechet and J.R. Yang, Metallurgical and Materials Transactions 45A 5351-5361 (2014). “A microstructure evolution model for intercritical annealing of a low carbon dual-phase steel” M. Kulakov, W.J. Poole and M. Militzer, ISIJ International 54A, 2627-2636 (2014). “Atomistic simulations of the interaction of alloying elements with grain boundaries in Mg” L. Huber, J. Rottier and M. Militzer, Acta Materialia 80 194-204 G014). “Multi-scale modeling of phase transformation s in steels”, M. Militzer, J.J. Hoyt, N. Provatas, J. Rottier, C.W. Sinclair and H. Zurob, JOM 66, 740-746 (2014). “Study of the interaction of solutes with :E5(013) tilt grain boundaries in iron using density-functional theory “, H. Jin, I. Elfimov and M. Militzer, Journal of Applied Physics 115, 093506 (2014). “Accelerated recrystallization in electrodeposited dual-layer copper thin films“, N. Alshwawreh, M. Militzer, 0. Bizzotto and J.C. Kuo, Journal of Electrochemical Society 160, 03154-03157 (2013). “A three-dimensional atomistic kinetic Monte Carlo study of dynamic solute-interface interaction”, A.T. Wicaksono, C.W. Sinclair and M. Militzer, Modelling and Simulation in Materials Science and Engineering 21, 085010 (2013). “Grain boundary curvature and the kinetics of grain growth in the presence of particle pinning pressure”, .S. Shahandeh and M. Militzer, Philosophical Afaga: ine 93, 3231-47 (2013) (Received runner’s-up certificate as a “highly commended” paper in the James Clerk Maxwell Young Writers Prize competition 2013). “Interaction of recrystallization and austenite formation”, M. Kulakov, W.J. Poole and M. Militzer, Metallurgical and Materials Transactions 44A, 3564-3576 (2013). “30 phase field modelling of recrystallization in low-carbon steel”, B. Zhu and M. Militzer, Modelling and Simulation in Materials Science and Engineering 20, 085011 (17pp) (2012). “Phase field crystal model of solute drag”, M. Greenwood, C.W. Sinclair and M. Militzer, Acta Materialia 60, 5752-5761 (2012). “Friction pressure method for simulating solute drag and particle pinning in a multiphase-field model“, S. Shahandeh, M. Greenwood and M. Militzer, Modelling and Simulation in Materials Science and Engineering 20, 065008 (18pp) (2012). “Ab initio calculations of rare-earth diffusion in magnesium”, L. Huber, I. Elfimov, J. Rottier and M. Militzer, Physical Review B 85, 144301-1 to 144301-7 (2012). “Resistivity-microstructure correlation of self-annealed electrodeposited copper thin films”, N. Alshwawreh, M. Militzer, 0. Bizzotto and J.C. Kuo, Microelectronic Engineering 95, 26-33 (2012). “Modelling phase transformation kinetics in Fe-Mn alloys”, T. Jia and M. Militzer, /SIJ International 52, 644- 649 (2012). “Modelling simultaneous formation of bainitic ferrite and carbide in TRIP steels”, F. Fazeli and M. Militzer, /SIJ International 52, 650-658 (2012). “In situ measurement and modelling of austenite grain growth in a Ti/Nb microalloyed steel”, M. Maalekian, R. Radis, M. Militzer, A. Moreau and W.J. Poole, Acta Materialia 60, 1015-1026 (2012). “ALEMI: A ten year history of discussions of alloying-element interactions with migrating interface”, G. Purdy, J. Agren, A. Borgenstam, Y. Brechet, M. Enomoto, T. Furuhara, E. Gamsjager, M. Goune, M. Hillert, C. Hutchinson, M. Militzer and H. Zurob, Metallurgical and l\laterials Transactions 42A, 3703-3718 (2011 ). “Modelling of microstructure evolution in advanced high strength steels”, M. Militzer, F. Fazeli and H. Azizi­ Alizamini, La Metallurgica ltaliana, No. 4, 35-41 (2011). “Formation of ultrafine grained dual phase steels through rapid heating of ferrite-carbide aggregate in plain low carbon steels”, H. Azizi-Alizamini, M. Militzer and W .J. Poole, IS/J International 51, 958-964 (2011). “Austenite formation in plain low C-Mn steels”, H. Azizi-Alizamini, M. Militzer and W.J. Poole, Metallurgical and Materials Transactions 42A, 1544-1557 (2011). “In-situ evaluation of metallurgical phenomena using laser generated ultrasonic waves”, T. Garcin and M. Militzer, Proceedings of the International Conference on Solid-solid Phase Transformations in Inorganic Materials 2015 (PT.\12015), in press. “Multi-scale quantum mechanical calculations of solute-grain boundary interaction”, L. Huber, B. Grabowski, M. Militzer, J. Neugebauer and J. Rottier, Proceedings of the International Conference on Solid-solid Phase Transformations in Inorganic Materials 2015 (PT.\12015), in press. “A new approach using EBSD to quantitatively distinguish complex transformation products along the HAZ in X80 linepipe steel “, J. Reichert, M. Militzer, W.J. Poole, L. Collins and D.M. Duan, Proceedings of International Pipeline Conference 2014 (IPC 201./). Calgary 2014. “In-situ measurement of grain growth and recrystallization by laser ultrasonics “, M. Militzer, T. Garcin and W.J. Poole, Materials Science Forum 753, 25-30 (2013). “Phase field modelling of microstructure evolution in the HAZ of X80 linepipe steel”, M. Toloui and M. Militzer, Proceedings of International Pipeline Conference 2012 (IPC 2012), Calgary (2012), paper 90378. “Formation of martensite/austenite (MA) in X80 linepipe steel”, J. Reichert, T. Garcin, M. Militzer and W.J. Poole, Proceedings of International Pipeline Conference 2012 (IPC 2012), Calgary (2012), paper 90465. “Integrated model to predict microstructure and mechanical properties in the heat affected zone for X80 linepipe”, W.J. Poole, T. Garcin and M. Militzer, Proceedings of International Pipeline Conference 2012 (/PC 2012), Calgary (2012), paper 90337. “Ultra-fine grained dual phase steels”, M. Militzer, H. Azizi-Alizamini and V.C. Sangem, J. Ultrafine Grained Nanostruct. Mater_ 45, 1-6 (2012).